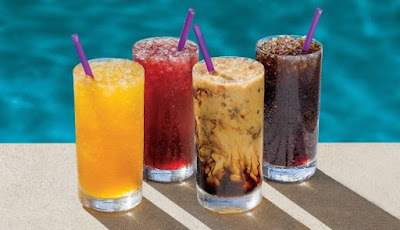 The Coffee Bean & Tea Leaf expands their selection of cold brew coffee and teas this summer with several seasonal varieties including the return of Vietnamese Cold Brew Coffee. The Coffee Beans' cold brew coffee features a blend of Bali Blue Moon and Ethiopia Yirgacheffe coffees and chicory that has been steeped in cold water for 20 hours. Vietnamese Cold Brew Coffee features the cold brew coffee mixed with sweet condensed milk. - New Mango Cold Brew Tea - Cold-brewed Scottish Breakfast tea blended with sweet mango puree. - New Black Cherry Cold Brew Tea - Cold-brewed Scottish Breakfast tea blended with black cherry puree. The chain's cold brew teas are steeped with cold water for five hours. The seasonal trio of drinks can be found at participating locations through August 26, 2018. The Coffee Bean's regular cold brew line up includes Cold Brew Coffee, Raspberry Cold Brew Tea, and Peach Jasmine Cold Brew Tea. As a way to promote the cold brew menu, they're offering any small cold brew coffee or cold brew tea for $2 every Thursday in June, from 2 to 6 PM, at participating locations. Photo via The Coffee Bean.